The bridge that carries Capital of Texas Highway (also known as Loop 360) over Lake Austin is one that brings Austin pride. 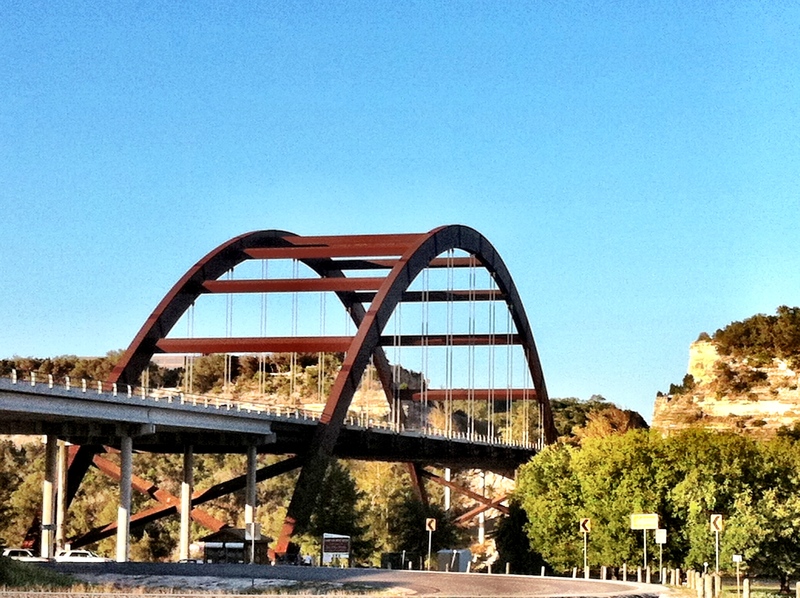 The Pennybacker Bridge, also known as the 360 Bridge, has stood in west Austin since just before its official dedication on November 29, 1982 by Austin mayor Carole McClellan and other public officials. It is both beautiful and unique and offers up some of the most panoramic views of Austin and the surrounding hill country. Besides the incredible views that it offers, the bridge is an architectural marvel. It was constructed using 600 million pounds of special steel from Japan with a rust color that blends in with the landscape. The bridge stands at 1,150 feet long and has a 600-foot central arched span suspended by 72 steel cables. Interestingly, it never touches the water below, which keeps the lake free from support columns, making it safe for recreational use. At the time of its construction, there was only one other bridge like it in the world. These elements all combined to help the bridge win first place in the 1984 Federal Highway Administration’s Excellence in Highway Design competition, and in 1992 it was deemed the most innovative example of architecture in Austin by the Austin members of the Consulting Engineers Council of Texas. Though the hike around the bridge is a little tricky, the cliffs on the northwest corner are the best place to take in the view. If you’re bringing children or pets, a six-foot wide pedestrian bridge is available for visitors. The bridge is also unique because there is no artificial lighting on the bridge, giving a natural view of the surroundings, any time of day. The bridge is named after Percy Pennybacker, a civil engineer from Texas who was a pioneer in the technology of welded structures. A graduate of the University of Texas and a World War I veteran, Pennybacker revolutionized the process of using welding instead of traditional rivets to build bridges during World War II, helping save the state of Texas millions of dollars. If you are looking for a luxury Lake Austin home with a view of Pennybacker Bridge, perform an Austin Home Search and let Austin REALTOR® Brian Talley help you find the perfect home.